The flipped classroom is an innovative pedagogical model that sees the typical lecture and homework elements of a course reversed. Short video lectures are viewed by learners at home before the class session, while in-class time is devoted to exercises, projects, or discussions with the teacher acting as a tutor, mentor and guide. Flipped Learning is particularly relevant in vocational education which focuses on learning by doing and applying knowledge in a real setting. In vocational learning there is an even greater need for teachers and trainers to teach practice, rather than theory. The flipped classroom approach therefore is favoured in vocational education as it allows for valuable face-to-face time for practical applications and a more personalised experience for learners. Research is indicating that courses that move to the ‘flipped’ model achieve much higher rates of retention and completion. Easy – just follow the link below to begin lesson 1 and start learning. The module is delivered using Ted Ed (We love Ted Ed and think you will also). Be sure to answer the assessment questions and engage in the discussions as you progress through the lessons. At the end of each lesson there is a link to the next lesson, click on the link to move on! Structure: Self guided learning via short video lessons, assessment, extra reading and discussions. Which Tech Tools Are Right For Your Flipped Class? There are TED-Ed’s videos and lessons for almost every subject. You can use videos already online or you can upload your own video to YouTube and then create a TED Ed lesson around them. 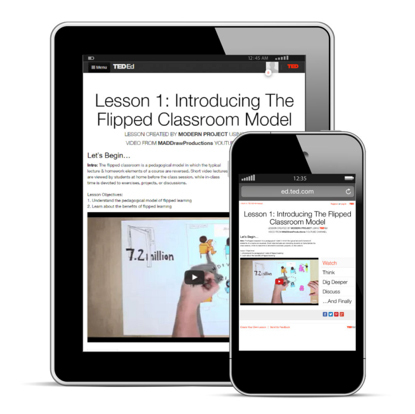 You can also include videos from some of the world’s best minds and create lessons around them! The platform is extremely user friendly, easy to set up and easy for students to follow. We also love the reporting aspect and instant notification you receive when you get feedback or replies to your discussions. Using TED Ed’s THINK section, you can assess how you learners have understood the video/lesson via multiple choice or open questions. You can satisfy learners who are hungry to learn more by providing extra reading and learning resources in the Dig Deeper Section. TED Ed encourages peer to peer learning which you can embrace by including guided discussions on your lesson topics. In 1993, Alison King published “From Sage on the Stage to Guide on the Side” which focuses on the importance of the using of class time for the construction of meaning rather than information transmission. In 1997, Harvard professor Eric Mazur developed an instructional strategy he called peer instruction which moved information transfer out of the classroom and information assimilation into the classroom. His approach allowed him to coach students in their learning instead of lecturing. Meanwhile in 2000, Lage, Platt and Treglia published a paper entitled “Inverting the Classroom: A Gateway to Creating an Inclusive Learning Environment“, which discussed their research on flipped classrooms at the college level. In 2004, Salman Khan began recording maths videos at the request of a younger cousin he was tutoring because she felt that recorded lessons would let her skip segments she had mastered and replay parts that were troubling her. On the basis of this Salman founded the Khan Academy which has become synonymous with the flipped classroom strategy. In 2007, Woodland Park High School chemistry teachers Jonathan Bergmann and Aaron Sams became driving forces in flipped teaching at the high school level when they recorded their lectures and posted them online in order to accommodate students who missed their classes. They have since become pioneers for the learning model. In 2011 educators in Michigan’s Clintondale High School flipped every classroom. Principal Greg Green led the effort to help teachers develop plans for flipped classrooms. The flipped class had many students who had already failed the class — some multiple times. After 20 weeks, students in the flipped classroom were outperforming students in the traditional classrooms. College attendance went from 63% in 2010 to 80% in 2012. In 2014, MEF University, a non-profit private university located in Istanbul, Turkey, admitted its first students. MEF University is the first university in the world that has adopted the “Flipped Classroom” educational model university-wide. The Flipped Classroom approach suits everyone – from the students who struggle to absorb material to the student that’s ahead of the curve! Flipped Classrooms Increase Student-Teacher Interaction – when you don’t have to lecture students during class time, you are able to spend more time with students in class on a one to one basis. A Flipped Classroom Means You Get To Know Your Students Better – if you are spending more time in class with your students you are able to get to know them better and understand where they are struggling and what is at the root of the problem. A Flipped Classroom provides a more Personalised Learning Experience – each student learns at a different rate. With video lessons, students who understand a topic can speed through the video while those who struggle with a topic can replay the videos in order to understand it.